Andrew Zimmern is returning with even more enigmatic eats. 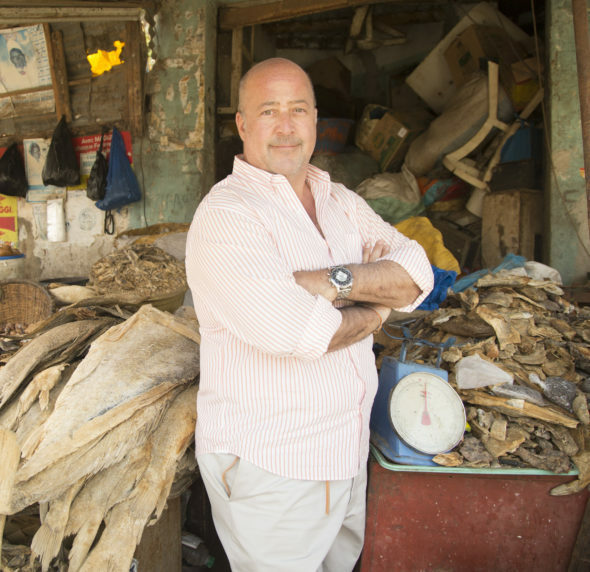 Travel Channel announces production has begun on the new season of its Bizarre Foods with Andrew Zimmern TV show. The next eight episode installment of Bizarre Foods follows Zimmern’s road trip across the United States. The show will visit the iconic Route 66 and the Pacific Coast Highway, as the chef and food writer explores the diverse food and culture of the USA. Get the details from this Travel Channel press release. NEW YORK (September 12, 2016) – Production is currently underway on a new season of Travel Channel’s successful series, “Bizarre Foods” with Andrew Zimmern. Now filming exclusively across the United States, the eight new episodes of the series follow Zimmern on the ultimate road trip along America’s most iconic and historic routes, including Route 66 and the Pacific Coast Highway. During the journey, Zimmern – a James Beard Award-winning TV personality, chef, food writer and culinary explorer, who also serves as an executive producer on the series – explores our nation’s diverse food and culture through his unique “Bizarre Foods” lens. What do you think? Are you a fan of the Bizarre Foods TV series? Do you plan to tune in for the new season on Travel Channel? More about: Bizarre Foods, Bizarre Foods: canceled or renewed?, Travel Channel TV shows: canceled or renewed? I think it was much better when Andrew really was eating “bizarre” foods. There is nothing really bizarre about the food he eats on the newer episodes. Delicious, yes. Bizarre, no.